Hennepin County has more rain barrels for sale. 18 left as of October 13. $62 each. This is your last chance. There are no more incoming shipments and no more will be sold after 2008. Urban Wanderlust has a list of all the goodies they’ve canned and/or frozen this year out of their garden, CSA share, or locally grown fruit. So cool. How many people even know what grows in Minnesota? I don’t. In case you wanted to know you can buy pepper spray at General J’s Army Surplus. Thinkery stops by the St Louis Park treehouse. I used to live kitty corner from that thing, but I never actually walked across the street to take a closer look at it. The Daily Planet’s Arts Orbit blog has an update on the behind-the-scenes situation at the Southern Theater. Drama! Also at the Daily Planet is an article from the MN Daily saying that, as bike commuting has doubled over the last year, so have fatalities to bicyclists. Injuries have increased as well. There have been nine recorded bike fatalities in Minnesota so far this year, vs four in 2007. (Note that that’s across the whole state.) I’d like to see a death-per-thousand-cyclist statistic similar to how they report driving fatalities. The (three, so far) commenters disagree vehemently, saying it’s been shown that injuries to bicyclists decrease as the number of cyclists decreases because everyone’s more accustomed to sharing the road. Insert “drivers and cyclists alike should follow the rules of the road” argument in which everyone blames everyone else [here]. This was posted at the Hennepin County Service Center in Eden Prairie. 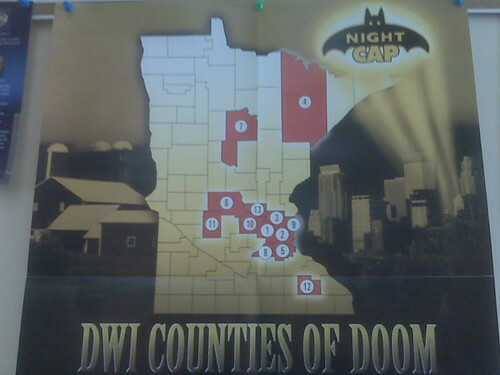 I forgot to take note of who produced the poster, and of course when I googled “DWI Counties of Doom” this photo is the only thing that came up.